To inquire about organizing a private tour in El Nido and the Bacuit archipelago, just send us an email from the contact page. We’ll be happy to get in touch with you! With the private tour, you decide at what time you want to start your journey. Just keep in mind that for safety reasons, our boats must be back in El Nido before dusk. Otherwise than that, it’s really up to you to decide when you want to go and when you want to come back! For sure, you can choose between the main A, B, C and D tours (or even from the combo tours). But since you will be the only ones on the boat, you can decide which islands you want to stop at and which ones you prefer to avoid. Our team can even recommend you some islands that are not included in the usual group tours. Just fire us an email and we’ll be happy to help you built the perfect island hopping private tour! Since you’re free to organize yourself as you please, you can also decide if you want to bring your own food or if you prefer to let us cook for you. Same thing goes with the beverages! Just let us know what you prefer and we’ll create a custom offer that will fit your needs. This is simple: you can basically make any of the tour we offer a private one. May it be one of the main island hopping tours in El Nido, a combo tour, a custom tour, an overnight camping or the Ultimate Adventure Tour. To get more informations on every kind of tour you can make private, click on the images below. Are There Other Ways To Discover The Islands Of The Bacuit Bay? 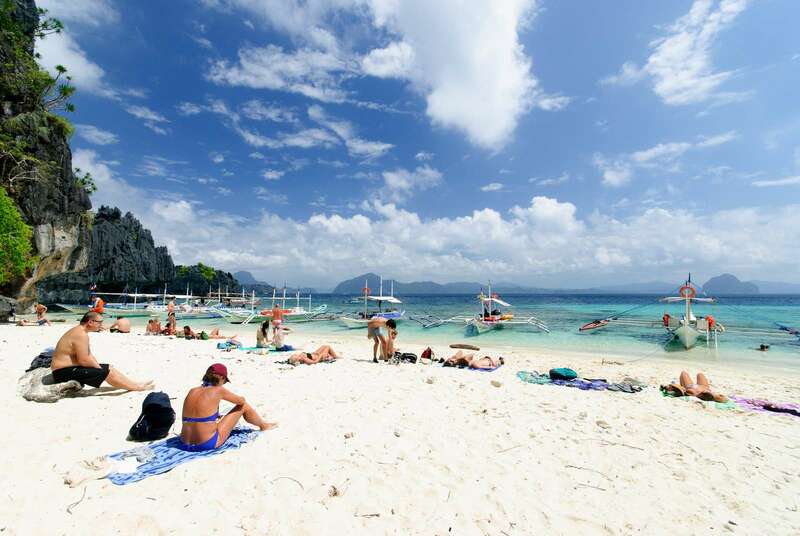 Tours A, B, C, D and their variant are the most popular way to go island hopping in El Nido. But these are not the only ones. As you saw above, there are other kind of island hopping activities you can choose from. Depending on the size of your group, the private tours may logically be more expensive than the similar group tours. The cost of organizing a private tour basically stays the same if you are 2 or 5 people… But if you’re traveling in a large group, private island hopping tours can be even cheaper than buying individual tickets for the similar group open tours! In any case, we’ll be happy to organize the tour of your choice and to adjust the price according to the number of guests there are in your group. To get the best pricing, just contact us! Palawan knows two seasons: the dry one (from December to May) and the wet one (from May to November). In both case, the weather stays relatively hot. The only difference resides in the rainfall amount. You can check the seasonal averages here. The best conditions to go island hopping in the El Nido area are thus reunited between December and May. Coming at that time of the year will give you the best chances to benefit from clear blue skies and a sunny weather. Otherwise than that, the best moment of the day to go island hopping is in the morning, anywhere between 7 and 10am. The reason you should start your tour early is because of the length of the days in this tropical region. For safety reasons, the boats should head back to town before night (which falls around 6pm). You Have A Question About Island Hopping In El Nido? If so, feel free to contact us by clicking the following button. We'll be happy to answer you!